BOISE – As Girl Scouts fan out across the state for their annual cookie sale, Idaho taxes will gobble up 22 cents of every $3.75 box sold. The Girl Scouts of the Silver Sage Council aim to change that, so they’re pushing for legislation this year to end Idaho’s distinction as one of just two states – Hawaii is the other – that still tax Girl Scout cookies. “I honestly did not know, along with most of my colleagues … that we were taxing the cookies the way we are,” said state Rep. Eric Anderson, R-Priest Lake, the bill’s lead sponsor. Removing Idaho’s 6 percent sales tax from the fundraiser cookies would cost the state roughly $140,000 a year in lost revenue. But the Girl Scouts say the money goes to a great cause: 23 percent of Silver Sage Girl Scouts are on scholarship, and the money to pay for their membership fees, badges, sashes and for camp comes from the cookie sale. “I don’t want to leave any of these young ladies that are out there working hard to sell cookies not being able to go to camp because we kept $140,000 of their money,” Anderson said. Plus, Girl Scouts sponsor anti-bullying and science and math education programs among other good works; and their results speak for themselves: 80 percent of Girl Scouts go on to earn bachelor’s degrees; 80 percent of U.S. women business owners are former Girl Scouts; every female astronaut who’s flown in space is a former Girl Scout; and 70 percent of the women in the U.S. Congress are former Girl Scouts. “The state shouldn’t be balancing its budget on the backs of Brownies,” declares Julie Hart, a lobbyist who’s representing the Girl Scouts free of charge, and who’s also the mother of a 9-year-old Brownie, Ella Marcum-Hart. She was among about 30 Girl Scouts who came to the state Capitol on Monday to press the case for their program and their tax bill, which currently is awaiting a hearing date for possible introduction in the House Revenue and Taxation Committee. 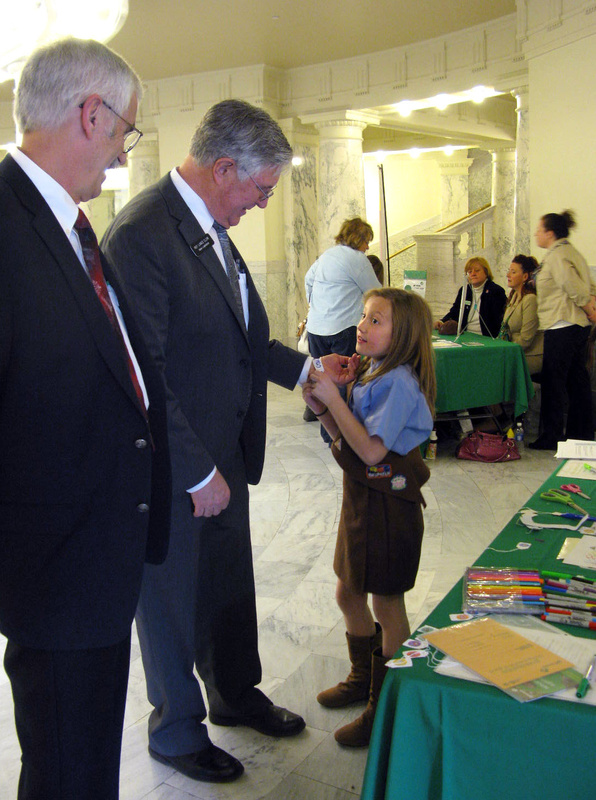 The Scouts distributed cards to every lawmaker about their cookie program, including how it helps the girls learn money management, business ethics, goal setting and people skills. They set up displays in the rotunda of the state Capitol, where lawmakers could meet them, hear about their legislation and exchange their cards for a free box of Girl Scout cookies. Hart said she’s received overwhelmingly positive response from legislators so far – except from the Revenue and Taxation Committee, where her bill awaits action. She’s hoping to get an introductory hearing date soon; Ella already is working on her speech in favor of the bill. State Rep. Gary Collins, R-Nampa, the committee chairman, said, “I’m not saying that the Girl Scout cookies isn’t a good cause and all that, but there are a lot of good causes out there.” His committee already has approved a sales tax exemption this session for anti-abortion pregnancy resource centers; that bill has passed the full House. But Collins noted its estimated fiscal impact was only $10,000 a year, and said some lawmakers are concerned that the state budget will be tight next year.